It would be fair to say that I look at a lot of watches, in fact “breakfast, lunch and dinner” would probably be an understatement. A while ago I came across Brellum Swiss Watches on Facebook, and straight away was excited to see a watch that was so much more than the average microbrand. Beautiful classic styling that screamed quality, refined lines of detail, and a huge attention to detail that I would normally expect to see on the top end brands we are so familiar with in the exclusive high street shops. It is not very often that i see a watch and think “If i were making a watch it would look like that”, so I approached Sebastien Muller at Brellum Watches and asked for some words about the watch collection, and we have been chatting ever since on Facebook, and today he sent me his media release. BRELLUM Swiss Watchmaking is an independent Swiss brand developing, producing and marketing high quality timepieces for admirers of exceptional craftsmanship. The cradle for Jura watchmaking and ancestral know-how is located at Porrentruy which is a medieval city built in 1148. So I am proud to represent the 4th generation of Muller family watchmakers who have been succeeding one another in this craft since 1885. I now feel that at the ripe old age of 42, a return to my craft-industry watchmaking roots is now an obvious evolution after studying for a watchmaking apprenticeship and with more than 25 years entirely dedicated to the acquisition of diverse skills in posts such as Product manager, Quality control manager and Production manager in world famous watchmaking companies as well as having developed hundreds of models and having produced several million Swiss watches. BRELLUM Swiss Watchmaking was born out of a desire to offer a demanding clientele my vision of what Swiss watchmaking should look like not only for today but also in the future. Products with timeless and durable lines, manufactured using high quality materials with reliable automatic mechanical movements, fully adorned and officially certified by the Officiel Suisse des Chronomètres (COSC). The BRELLUM name is full of symbolism and values that are personal. The first letter of BRELLUM is also the first letter of Bonfol, my village of origin. As the Italian writer Antonio Gramsci explains, « in order to know where one is going, we must remember where we come from », a philosophy that BRELLUM adheres to. Take the example of the Duobox model which has been inspired by the past but produced with the help of modern technology. The brand’s logo was inspired by a strange animal in regional mythology called the Wyvern. It is a dragon like beast with wings, a bird’s body and a snake’s head which is a legendary symbol popular in storytelling. A precious stone known as a carbuncle is encrusted into the wyvern’s forehead. The stone’s symbol is discreetly found on the crown of all BRELLUM watches. The reliability and durability of BRELLUM watches are part of my deeply held values» Fundamental choices and essential actions are behind these words. Indeed, not only in the selection of partners and suppliers, the materials which are employed for the making of the components (sapphires and steel 316L, DIN 1.4435), the legendary precision of Valjoux movements « certified chronometer » (COSC), but also the numerous quality control processes both during and after manufacture are all factors in making BRELLUM timepieces objects that you will be able to pass on to future generations. 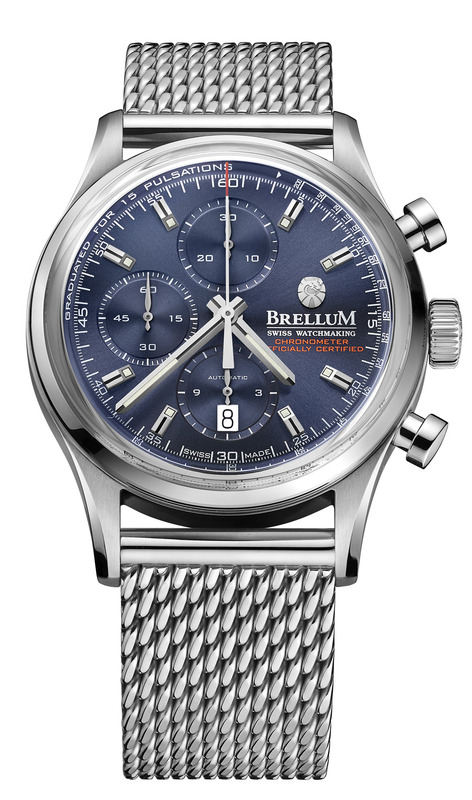 As a guarantee of quality and respectability, all BRELLUM watches proudly display the Swiss Made designation. This distinction is reserved for brands that comply with the requirements of Swiss federal legislation. In addition to the Swiss Made label, each movement of a BRELLUM watch also adopts the “Certified Chronometer” certification standards (COSC). This label is only reserved for the movements of watches which successfully pass a constraining group of tests which determine the precision and stability of each movement. Validation is carried out by an independent body known as the Contrôle Officiel Suisse de Chronométrie (COSC). Each BRELLUM watch comes with its own individual certificate of chronometry where each measurement result is recorded. Only 6% of the total Swiss watch production, as is the case with BRELLUM watches, has the designation «chronometer officially certified» inscribed on the dial. It is in the heart of the Swiss Jura in the medieval city of Porrentruy (constructed in 1148), where the BRELLUM brand perfectly expresses the link between traditional watchmaking and new technology. We rely on ancestral know-how and modern manufacturing techniques in order that an unforgettable experience can be offered to our esteemed clientele concerning luxury high-end watchmaking. Thousands of watchmaking craftsmen have worked in the region throughout the centuries (more than 9,000 have been recorded to date by the Watchmaking Foundation) and hundreds of watchmaking brands have also been created. The entire region has dedicated itself to this craft which has accumulated over the past centuries significant ancestral know-how. Even up to the end of the 19th century, our watchmakers would regularly travel by train to Geneva or other large cities in Switzerland so as to meet with their clients in order to sell their creations. This type of business contact has been lost over the years in favor of a marketing system that we are all familiar with today. It is this close proximity with those passionate about the art of beautiful watchmaking that I wish to find today through the technology of communication and particularly through the Internet site and social media. It will enable me to market my watches directly, “from the watchmaker to the enthusiast”, thus offering an affordable experience of high-end luxury watchmaking. An adventure experienced in the comfort of one’s own living room or while on the move. BRELLUM watches are hand-assembled with the greatest of care, in a climate-controlled and dust-free zone and distinguished by their excellent quality. A level of excellence made possible through an unwavering and determined professional commitment at every stage of manufacturing. The strict application of thorough inspection processes ensures that every BRELLUM watch delivered to its new owner is of unquestionable quality. Each BRELLUM watch undergoes very strict controls at each stage of its manufacture in order to guarantee correct function and reliability. Before assembly, each movement is checked by an independent body, the Contrôle Officiel Suisse des Chronomètres (COSC) which carries out an exhaustive procedure. The movements are laboratory tested over a period of more than 15 days in accordance with the ISO 3159 standard. The measurements taken ensure precision (-4/+6 sec/day), stability and allow for precision deviations at different temperatures and in different positions. A total of 7 criteria must be respected in order to obtain the official certificate which authorizes BRELLUM to proudly inscribe the mention « Chronometer Officially Certified » on its dials. An ultimate group of tests are carried out on our watches after assembly so as to guarantee that they are just perfect before they leave our workshop. 1. The precision of the movement and the amplitude of its pendulum are tested again before assembly with the help of high-performance equipment. 2. The water-resistance of each watch is checked after assembly during a cycle which lasts several minutes in which different pressurized conditions are recreated. 3. Both an aesthetic check as well as a manual verification of each of the watch’s functions is carried out before undergoing the following check. 4. In order to guarantee the performance of the rate duration, each watch undergoes a 46-hour verification of the operating reserve and the chronometer mode. 5. An ultimate operating test is done on every watch before delivery, in an automatic machine which simulates the wearing of the watch. What is a CERTIFIED CHRONOMETER watch? The mention “certified chronometer” ensures that the movement of your BRELLUM watch is adjusted to an average daily rate criteria of -4/+6 seconds per 24 hours achieving 99.99% accuracy (ISO 3159). This absolute guarantee of reliability and precision is given out by the Contrôle Officiel Suisse de Chronométrie (COSC). Indeed, only 6% of the total Swiss production which is exported enjoys this distinction. Which authority officially certifies your CHRONOMETER watch? The Contrôle Officiel Suisse de Chronométrie (COSC) is an independent and official body which is recognized by the Swiss State. Its laboratories and watch certification offices are all based at Bienne in Switzerland at Locle and Saint-Imier. Each one of them has “Service de Calibration Suisse” accreditation. What are the test conditions like that are carried out by the COSC? The COSC carries an exhaustive examination on each movement through a range of tests lasting 15 days in accordance with the ISO 3159 standard. The movements undergo individual daily tests during these 15 days according to a defined program of tests in five positions and at three different temperatures (8°, 23°and 38°C). Each day and including Saturday and Sunday, the instruments are measured and reassembled. Seven eliminatory criteria are calculated based on these measurements. What are the COSC’s 7 main criteria for measuring success? If and only if the 7 criteria are met, the movement is officially “certified chronometer”. Only 299 Duobox Chronometer watches are produced each year. Its timeless design is characterized by its concave sapphire glass, its slightly convex dial surmounted with diamante appliques and its perfectly dimensioned hands. The Duobox collection is so named with reference to its two concave sapphire watch faces which were formerly produced in plastic. The first one protects the dial allowing for optimal viewing due to the anti-flare treatment that has been undertaken in the manufacturing process. The second one covers the back of the timepiece and allows for the automatic movement of the watch to be admired in detail and at all times. The contact of sapphire with the skin offers the wearer optimal comfort. The automatic movement, indeed the heart that beats inside the Duobox Chronometer, is the Valjoux 7750. This was developed in the 70s thus being recognized for its qualities concerning precision and robustness and has since been elevated to the rank of a Swiss watchmaking icon. Carefully decorated, it is surmounted by BRELLUM’s oscillating mass which has also been treated with the same level of delicacy. As a guarantee of absolute precision, the movement is officially “certified chronometer” by the COSC which is an independent body that issues an individual chronometer certificate with each BRELLUM watch.